Whle doing some further research into Aristide Cavaille'-Coll, I came across this man, who must have been the most prolific builder of house organs ever, and who must have also been Cavaille'-Coll's best customer. He was born on 17th September 1852 at Metz. His father Edouard wast the regional governer of Metz, his mother was Marie-Josephine de Gargan, whose own mother was a member of the De Wendel family,, one of the most powerful in the province of Lorraine who controlled the greatest iron and steel empire of the mid-19th century. He learned the piano, harmonium and organ as a child,, and with the Paris World Exhibition in 1867, discovered more about the wider world without ever having to leave the banks of the Seine. He visited Paris regularly to see other members of his family on th Rue Las Cases,, very near to the church of Sainte-Clotilde where he may have heard Cesar Franck playing the organ. Anyway,, it seems that his desire to own a large organ himself dates fro this time. From 1870 he made several journeys by train to Paris, exploring churches and listening to their organs, comparing the qualities of various instruments, as well as visiting the Paris Conservatoire where Cesar Franck taught. He also made several visits to Cavaille'-Coll's workshops on the Avenue du Maine. His family connections had made him extremely rich (according to his sparse Wikipedia entry). However, he was weak in health, protecting himself from any pollution and always searching for the ideal climate. He was an extremely intelligent man and a great builder, and so Albert de L'Espee came to own, among the estates he inherited and the acquisitions and the places he built for himself, some ten large properties throughout France, of which seven of them he furnished with organs. In 1880 he installed a small Cavaille"-Coll instrument with ten stops, identical in specification to the one owned by Eugene Gigout, in the family chateau at Antibes. For the World Exhibition of 1878, Cavaille'-Coll installed a large organ in the Trocadero Concert Hall in Paris. This was exactly the kind of organ that Albert hoped one day to own himself. However, he quickly realised that the acoustic in the place was appalling. Therefore, he decided that after consulting with Cavaille'-Coll, he would have his own concert hall built that would provide a faultless acoustic for an organ. In 1890 Cavaille'-Coll was given the commission for an instrument around which the Baron would have a house built. For the location he settled on Biarritz in the far south-west of the country, and the house would be named "Chateau d' IIllbarritz". 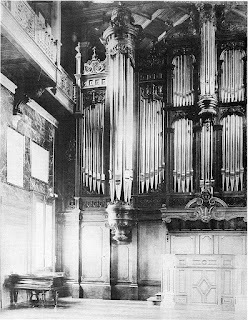 The mansion (still there) was completed in 1897 and the great organ installed, an instrument of four manuals and pedal, 72 speaking stops, complete with three swell boxes. In addition, a full chorus of Chamade Trompettes of 16, 8 and 4ft pitch was included, along with three full-length 32ft pedal stops. Very soon after completion, the quietness of the night was violently disturbed by the sounds of "Parsifal" and "Tannhauser" by the Baron's favourite composer. After disappointment in love and divorcing his wife, Albert decided to sell the chateau but could find no buyer. He played the organ for the last time in 1902 and the following year, Charles Mutin (Cavaille'-Coll's successor) bought it back and installed it in the company's workshops. It stayed there until 1913, when a place for it was found at the church of Sacre-Coeur de Montmartre, Paris, with a new case but keeping the original console. After that Albert decided not to sell the chateau, and so he ordered from Charles Mutin, a new three manual and pedal organ of 62 stops. Part of this instrument was later re-used in the organ at Uzerbil, near Bilbao, Spain. At the same time, the Baron had bought in 1892 an enormous private mansion: Nr.50, Avenue du Bois de Bolugne in Paris (now knwn as Avenue Foch, the same street where Claude Debussy lived from 1905 until his death). Once again Cavialle'-Coll was asked to build an organ with three manuals and pedal with 47 stops. This, however, was never going to work out well from the start. The late night noise that Albert was making, playing Wagner's music on the full organ, soon brought objections from his neighbours who were just trying to get a good night's sleep. The problem became so bad that they eventually joined together to make a formal complaint. Reluctantly, Albert realised he had no option to get rid of the organ rather than to lose favour with the whole district. It was then either bought, or was given as a gift, to Count Christian Berthier de Sauvigny in 1907, another good amateur organist who had in his own home on the Rue Legendre, a two manual and pedal, 20 speaking stop organ build by Joseph Merklin, another great Parisien organ builder. Also around the same time, the new church of Saint Antoine des Quinze-Vingts (started in 1903) was nearing completion and it was suggested to the parishioners involved in the project that they slould perhaps donate an organ to the church. 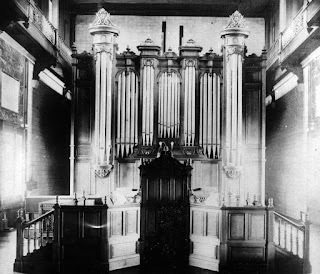 Therefore, the Count donated the organ to the church and it was moved from the Baron' mansion and installed in its new home by Merklin in 1909, with a new case but retaining the original console once again. Count Berthier was also installed as its first organist and he was followed by successors that included Jean Langlais and Gaston Litaize. The organ is still there, virtually intact as Cavaille'-Coll had left it and is nowconsidered to be the best symphonic organ in Paris, and having played it several times myself I would completely agree. In 1893 Albert started to build another chateau on a new site at Belle-Ile. Once again, Cavaille'-Coll installed a new organ there with three manuals, pedal and 46 stops, very similar to the one now in Saint Antoine. Unfortunately, this instrument, along with the chateau was completely destroyed by fire when the Germans left Paris in 1945. Around 1897 the Baron succeeded in having yet another mansion built on the banks of Lake Montrion. Here he had Joseph Merklin install an Orchestrion, a curious entity, something like a cross between a piano and a barrel organ, operated by punched rolls as with a street organ. For his other property at Saint Vallier de Thiery, near Cannes, we find the Baron's final instrument, built by Merklin for the Villa Henriette, which lies between Monaco and Menton. Having learned from his bitter experience in Paris and the legal action with which he had been threatened, Albert greatly modified his ambitions, commissioning an organ containing just tweny speaking stops. When the villa was sold in 1913, the greater part of this organ was incorporated into the rebuilt instrument in Monaco Cathedral. Albert died on the 4th January 1918 athis house at Antibes aged 65 years. I think you'll agree that he was quite a remarkable man, and there's probably no one in that period who could have been more in love with the organ! What an amazing figure! Thanks so much for bringing him to light. I found details of the village above Grasse near Cannes but haven't found reference to his place yet, and nothing about his place in Antibes. Yes, I was also amazed when I first heard about him and I will try to find out more about him if I can. However, he does seem to be a difficult man to track down. I've tried to find a portrait or a photo of him, it would be great if one existed of him playing one of his organs. By what I've already found out about him, it would appear that he was a painfully shy man so despite his obvious wealth might never had consented to such a intrusion into his own closeted world, but I'm still hoping that there maybe such a picture of him somewhere. As to your two pictures, the lower one is the first organ that he had installed at Biarritz. The upper picture which I hadn't seen before must be of the second instrument installed in the mansion after he could find no buyer for it but couldn't bear to be without an organ to play the Ride of the Valkyries or other such Wagnervarian offerings. Incidentally, I would love to know what publications of Wagner's works that were transcribed for the organ and who transcribed them. My first thought was Sigfrid Karg-Elert but of course I quickly realised that he would have been far too young for the period we are dealing with here. Anyway, I'll try to get more information about our favourite Baron if and when I can. I must admit that I have been totally intrigued by this guy and that he's the most wonderful personally Ive found in the world of the organ for a very long time.